Bridal Bouquet has gathered chiffon petals in hues of pink and cream, femininity defined. California poppies require cold soil to germinate and a little thinning to allow them to develop fully. Self sows. Starting Indoors: Start in containers 2-3 weeks before last spring frost. Cover with plastic to retain moisture until germination occurs. Keep at 60-65°F. Starting Outdoors: Recommended. Direct sow in early spring or fall; late winter in mild winter areas (zones 8-10). In springtime, at last frost date. California poppies are beguiling wildflowers with teardrop buds opening to silky lustrous cups, closing in the evening and when cloudy weather reigns. They self sow readily and often find just the right spot to grow—along dry garden edges, rock gardens and gravelly spots where little else grows. 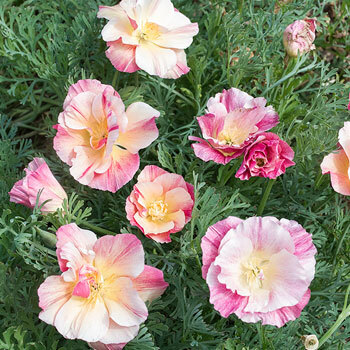 Best in areas where summer nights cool down, where they bloom long, elsewhere a spring to summer delight, especially when grown in large drifts. Watering Details: About 1" per week is plenty—drought tolerant and will likely not need watering except during particularly dry spells. However, regular watering may encourage more blossoms. Soil pH: No pH preference. Fertilizer: If desired, an all-purpose granular, organically-sourced fertilizer can be scratched into soil. An all-purpose water-soluble fertilizer is another good option. Flowering: Ruffly pink and cream flowers atop each stem. Seeds: Each flower will turn into a slender, almost string bean-like seed capsule containing tiny brownish-black seeds. Self sows. The California Poppy is the official state flower of CA.